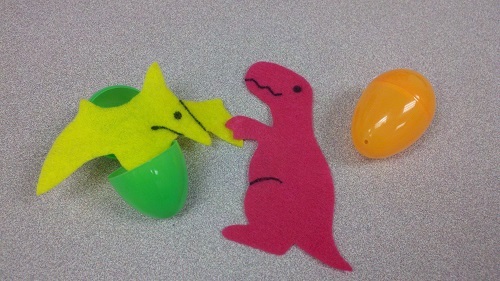 I made extra felt dinosaurs (Template from Mel’s Desk), and folded the dinosaurs up into Easter eggs. I then hid the eggs in a corner of the room. Prior to setting the children loose to find the eggs, I talked to them about how dinosaurs hatched out of eggs. Then I instructed each child to find two eggs and bring them back to their caregiver. Afterwards, we opened the eggs, and the children were able to bring their dinosaurs up to the flannelboard. The kids loved this activity! They liked the surprise of seeing which kind and color of dinosaur they got in their eggs, and, as always, they loved that they were able to put them up on the board. Afterwards, we counted how many dinosaurs we had on the flannelboard (19! ).